Thank you very much cef. this will result in fair gameplay. This isn't working for me. I keep getting glitched no mater how many times i reload the page or how many times I relogin to the page. Its very frustrating as the part that says i'm not a robot is not appearing for me and furthermore, I can't do anything in the game because of this ridiculous error. Please fix it. (2015-07-07, 01:03 AM)ch17175 Wrote: This isn't working for me. I keep getting glitched no mater how many times i reload the page or how many times I relogin to the page. Its very frustrating as the part that says i'm not a robot is not appearing for me and furthermore, I can't do anything in the game because of this ridiculous error. Please fix it. You do realize i'm not an idiot and i've already done that right atharva? That wasn't helpful at all whatsoever. (2015-07-07, 09:18 AM)ch17175 Wrote: You do realize i'm not an idiot and i've already done that right atharva? That wasn't helpful at all whatsoever. Nope, still not working. I've left it up for a few HOURS and its still not working. working for me but @sana cute also had that problem. (2015-07-08, 03:11 AM)ch17175 Wrote: Nope, still not working. I've left it up for a few HOURS and its still not working. can you post screenshot ? also what browsers did you try? what operating system do you use? windows etc? Having the same Problems, but i'm on mobile so i blamed it on the Connection. P.s. : sometimes you need to pick some pictures instead of just clicking the box. (2015-11-16, 11:37 AM)Blau Wrote: Having the same Problems, but i'm on mobile so i blamed it on the Connection. A captcha's sole use is to prevent the use of bots and the likes. How many people do we have here which do neither watch the anime, nor are up-to-date on the games? 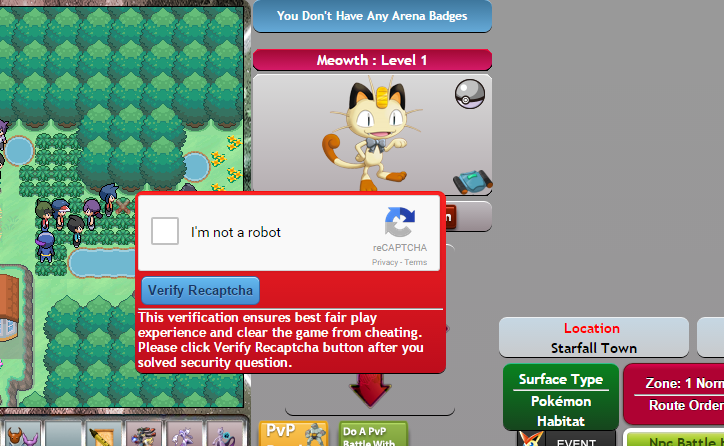 I wouldn't want being stuck on a captcha, only cause i don't care about pokemon outside this game. Stay with cookies and street signs (well maybe less street signs) and it's best for everyone.